You are currently browsing the archives for the Keith Downey category. 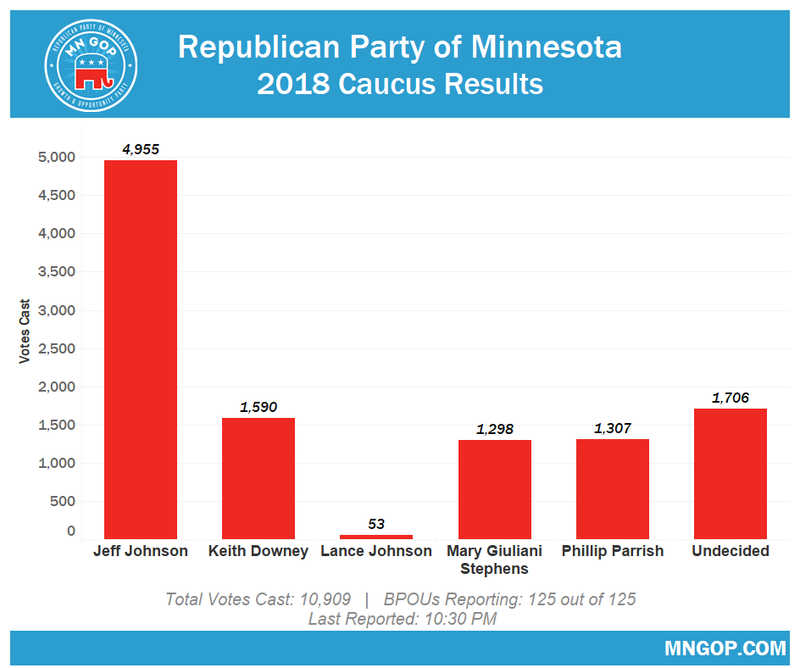 Jeff Johnson and Tim Walz won their party’s non-binding straw polls at Tuesday night’s precinct caucuses. Unfortunately for both men, that won’t get nearly as much publicity as the breaking news from earlier in the day. The other noteworthy news from Tuesday night’s straw polls is that Keith Downey underperformed, losing to Commissioner Johnson by a 45.4% – 14.6% margin. Perhaps, more embarrassing for Downey is the fact that he lost to “Undecided” by a 15.6% – 14.6% margin. After such a lackluster performance in the straw poll, the Downey campaign must ask themselves if there’s a legitimate pathway to the endorsement. At this point, nothing seems to suggest that there is a path to the endorsement. Full disclosure: I’m still undecided so I don’t have a dog in this fight at this point. At some point, I’m sure that will change. It’s just that it hasn’t changed yet. Turnout at Republican precinct caucuses were significantly smaller than at DFL, which can’t please Republicans. Still, tonight was the night when initial assessments were made. This isn’t the night when final decisions are made. If Walz is the DFL-endorsed candidate, it isn’t likely that he’ll have much of an enthusiasm gap in his favor. The Bernie Sanders wing of the DFL is dominant. That’s where the enthusiasm comes from. That isn’t where Tim Walz is from. Further, like I said earlier this week, Walz alienated NRA voters and the Iron Range. OF the 3 DFL finalists, all have difficult paths to the governor’s mansion. Erin Murphy is little known outside the Twin Cities. Further, she’s hated in rural Minnesota. Rebecca Otto is hated on the Range, especially after fundraising off of her decision to vote against approving mining exploration leases. It isn’t a secret that Keith Downey hasn’t been a competent state party chairman. This evening, though, Republicans got verification that he might cost Republicans some legislative seats because he didn’t get the basics right. He may also disenfranchise Minnesota’s Trump supporters. Whether Republicans followed the rules or not in naming their alternate delegates is something that I’ll let the courts decide. That being said, how can people have confidence in a chairman who can’t get the basics done? Didn’t Chairman Downey have a list of things that had to get done at the convention? If he didn’t, why didn’t he? It’s his responsibility to make sure that the essential things got finished. There’s no excuse for Chairman Downey not to make sure that the Republican Party of Minnesota didn’t meet its responsibilities as required by state statutes. Saying the equivalent of ‘I forgot’ doesn’t cut it. If you can’t finish the basics, you shouldn’t be part of leadership. Fundamentally, a state party chair has just two jobs—first, getting state constitutional officers elected and second, making sure the party’s presidential candidate is on the state ballot. Chairman Downey has yet to accomplish the first and has now endangered the second. Finally, and on a different subject, the worst kept secret is that Chairman Downey wants to run for governor in 2018. In light of this failure, I’d respectfully ask Chairman Downey to announce immediately that he isn’t going to run for governor. After this lawsuit, the ads virtually write themselves, with the wording going something like ‘if he can’t run a political party, how can he run an entire state?’ come to mind. While I’m critical of what Chairman Downey failed to do, I don’t have any ill will towards him. He was a skilled legislator. Perhaps he could contribute that way. There hasn’t been much of a dispute as to whether the DFL is attached at the lip with the Alliance for a Better Minnesota, aka ABM. After watching Almanac’s opening interview tonight, the debate is over on that. Ken Martin and the DFL are definitely attached at the lip to ABM. Once again, Republicans chose big corporations over real commitments to working families, schools, roads, bridges, and colleges. ABM could sue Martin for plagiarism if he didn’t still get his marching orders from them. While it’s true that he’s technically the DFL Party Chair, he’s still working for ABM. Let this post remind conservatives that the DFL a) isn’t tethered to the truth, b) is the same entity as ABM and c) won’t tell the truth about Republicans even if their lives depended on it. Ken Martin’s interviews are consistently filled with, putting it gently, inaccuracies. Put a bit more directly, I wouldn’t trust Ken Martin as far as I could throw him if I had 2 broken arms and a bad back and I was weak to begin with. Gov. Dayton’s statement is, at minimum, fiction. At most, it’s an outright lie. If Minnesota’s economy is “growing rapidly”, as Gov. Dayton insists, why haven’t revenues met projections 5 of the last 6 months? If Minnesota’s economy is “growing rapidly,” why did revenues fall 6.6% short of projections last month? There’s little doubt in my mind that Gov. Dayton will continue repeating that fiction the rest of the campaign. He isn’t worried that the media will question his statement. Brian Bakst certainly didn’t question Gov. Dayton’s statement. I haven’t seen other reporters question the Alliance for a Better Minnesota’s latest video that insists that Minnesota is working, either. Let’s be blunt about this. Gov. Dayton hasn’t hesitated in insisting that Minnesota’s economy is doing well. ABM hasn’t hesitated in insisting that life under Gov. Dayton is a return to the DFL’s glory days. The Twin Cities media hasn’t questioned the voracity of Gov. Dayton’s statements or ABM’s lies. ABM won’t say anything about the fact that DEED just announced the fact that Minnesota’s economy just lost 7,800 in the last jobs report. DEED reported that Minnesota’s economy shrunk by 4,200 jobs in July and that they’d overestimated the number of jobs created in June by 3,600. Gov. Dayton certainly won’t talk about the verifie fact that Minnesota’s economy has create a pathetic 2,900 jobs thus far this year. Why would he when he knows that ABM will lie for him and the Twin Cities media won’t question him? If Republicans don’t start questioning the media, Gov. Dayton and ABM, they’ll lose this highly winnable election. When I say Republicans, that’s everyone from Keith Downey to Jeff Johnson and Bill Quisle to legislative candidates like Dale Lueck and Jim Knoblach to the activists working to win over voters, then getting them to vote for Republicans. That graphic is proof that job creation tanked after the Dayton-DFL tax increase went into effect. That graphic verifies as fact that Minnesota’s economy has created few jobs this year. While jobs were created by the hundreds when Republicans had the majority in the House and Senate, jobs are being create by the dozens since the Dayton-DFL tax increases took effect. In fact, Minnesota had negative job growth last month. It isn’t surprising that Gov. Dayton and the Alliance for a Better Minnesota is telling whoppers about the state of the state’s economy. It’s up to Jeff Johnson and the Republican Party of Minnesota to swat down Gov. Dayton’s and ABM’s myths. The statistics are there. All we have to do is tell the truth. WURZER: How worried are Democrats about that race? MARTIN: I wouldn’t say we’re worried but we aren’t taking anything for granted. In a midterm, crazy things can happen and we’re working very hard in the Eighth Congressional District. We’ve got a great candidate in Congressman Nolan who has actually done the hard work of governing and getting things done on behalf of his constituents and I think that alone will help him win re-election. WURZER: Are you surprised that experts — so-called experts — think that this is a toss-up in what we’ve long thought of as a pretty deep blue district? MARTIN: No, I’m not surprised. Over time, the district has changed, no doubt about it. The addition of those southern counties has made it more competitive. There’s been a change in some of the demographics in the district sso I’m not surprised that pundits are saying that. I am surprised that they think it’s competitive because I think the candidate they have is really out of touch with the voters in that district. You have a guy in Stewart Mills who was born on third base and thinks he hit a triple. He’s never had to fill out a job application in his life and I don’t think that the blue collar workers of the Eighth District are going to take well to someone like Stewart Mills. DOWNEY: Well, take away the personal insults and I think Stewart Mills is actually a fantastic candidate for the Eighth and you combine that with the fact that people are figuring out that people on the Iron Range are waking up to the reality that Democrats are committed to pretty much shutting down mining entirely up on the Iron Range. You look at the values that Stewart Mills holds and his lifelong residency in the district. I think he’s a great fit in that district. What’s especially noteworthy is what wasn’t said. What didn’t get said is that Ken Martin didn’t dispute Chairman Downey’s statement that the DFL wants to shut down mining. The reason why that’s so noteworthy is because an attack unchallenged becomes the truth with voters. Chairman Martin didn’t have any wiggle room because he’s still working hard at keeping the environmental activist wing of his party from bolting from the DFL’s coalition. Right now, the DFL’s coalition is fragile. Chairman Martin can’t afford it to start breaking apart. That’s why Stewart Mills is a great candidate. He’s totally committed to making mining the Range’s economic growth engine for another generation. Rick Nolan isn’t. Martin’s snotty remark that Stewart Mills has never filled out a job application in his life should be exploited by the Mills campaign. I’d recommend they turn that around and ask Nolan the last time he managed a company’s health insurange plan. I’d ask him the last time he opened another major retail store that’s committed to paying its employees more than the minimum wage. I’d ask those questions because they’d expose Nolan to be the career politician he’s always been. I’d ask those questions to highlight the fact that Mills Fleet Farm is a popular store in the north country. Friday night, Ken Martin and Keith Downey met on Almanac’s set. Martin hurled insults while looking defensive. Downey debated while looking confident about the position Republicans are in. If it’s Sunday morning, rest assured I’m taping At Issue. This week, DFL Party Chair Ken Martin was asked about the DFL filing a complaint with the Campaign Finance Disclosure Board. The DFL filed this nuisance complaint in an attempt to deflect complaints about 13 DFL senators willfully breaking campaign finance laws by coordinating their ad campaigns with outside groups. On Tuesday the Board levied the fine against the DFL after it was discovered that 13 DFL candidates coordinated their campaigns illegally, since properly reclassifying the expenditures means that the candidates illegally exceeded their campaign contribution and/or spending limits. A total of over $300,000 in illegal contributions were not reported by the campaigns.. The board also plans to fine each individual campaign directly, according to a press release from the Minnesota Republican Party. These 13 DFL senators broke one of the most straightforward campaign finance laws on the books. I knew that candidates couldn’t coordinate their advertising campaigns with special interests’ ad campaigns. That law’s been on the books since the Nixon/Watergate era. Putting this most succinctly, these DFL senate candidates wanted to win their races so badly that they didn’t hesitate in breaking Minnesota’s campaign finance laws. It isn’t a stretch to think that Alida Messinger would’ve been willing to write the check for the fines in exchange for a DFL-controlled state government. DFL lawmakers disagreed with the board’s ruling said that they are glad to put the matter to rest. “Ultimately, it is best to set this distraction aside and allow our members to focus on governing,” DFL Party Chairman Ken Martin said. Martin is currently the director of “Win Minnesota“. If you read this blog, you know who they are: they are a PAC that launders the Dayton family’s political contributions to “Alliance For A Better Minnesota” and the “2010 Fund” and the other arms of the Dayton Campaign’s tightly-wound little money-laundering and distribution machine. ABM was criticized by local reporters and national organizations for their lies. Martin was part of that. Now he’s running the DFL, where he’s dismissing outright cheating as a distraction. Finally, Martin’s statement that we shouldn’t be ‘distracted’ by their cheating because they’ve got to govern is silly. Thus far, the DFL’s governance has been a disaster. Their tax increases hurt the middle class more than they hurt “the rich.” Their implementation of MNsure has been a total disaster. Gov. Dayton has made statements that question whether he knows what’s happening within his administration. It’s time for Minnesota to head in a different direction.